Peterhead North SNP councillor Anne Allan has described plans to end free parking periods in the town’s ‘Pay and Display’ council car parks as a “backward step” and “detrimental to Peterhead town centre”, ahead of a crunch council vote on Thursday. 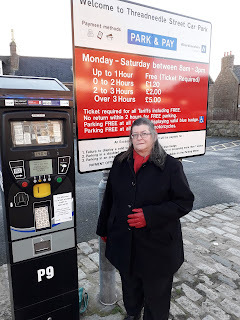 In a bid to start making a profit from Aberdeenshire’s loss-making car parks, Conservative and Lib-Dem members of the council’s Infrastructure Services Committee tried to begin the process of removing free parking periods from council ‘Pay and Display’ car parks last November. A counter-proposal from opposition councillors – which would instead have balanced the car parking budget while retaining a half-hour free parking period in all towns was defeated by 9 votes to 5, with Conservative and Lib Dem committee members voting against. However, the Conservative and Lib Dem bid to scrap the free period was thwarted after opposition councillors insisted that any decision on the change be taken instead by all 70 councillors at a meeting of January’s full Aberdeenshire Council. “Introducing a free parking period was a key pledge made by SNP councillors standing for election in 2012 and we campaigned strongly on this issue, working across party lines with other councillors get it introduced. “Having a free parking period removes one of the major disincentives for people who perhaps have only one or two items they need to get but don’t want to fork out to pay for parking when they are only going to need a parking space for maybe 10 minutes. It encourages people back into the town centre and that is a good thing. “The proposal to remove free parking from our car parks just doesn’t make sense and is a backward step. If shoppers are forced to pay for making even a brief stop-off, many customers will choose to go instead to the supermarkets.